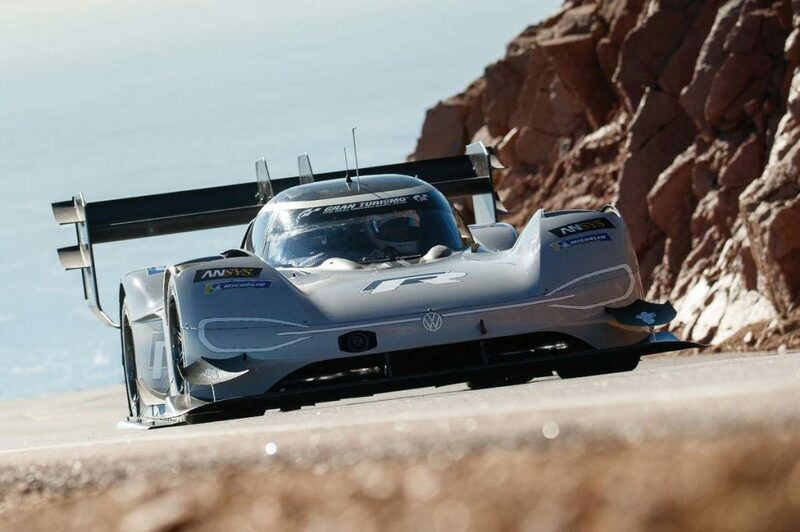 Volkswagen’s battery-powered entry driven by veteran racer Romain Dumas didn’t just break the Pikes Peak “Race to the Clouds” record in Colorado on June 24, they flat-out shattered it, breaking the eight-minute barrier in the 14.4-mile (19.9-kilometre) climb to 14,110 feet (4,300 meters) above sea level. That’s more than 16 seconds faster than anyone else. Now paved to the summit, the course allows electric powertrains with extreme downforce aerodynamics to excel. Dumas drove the VW I.D. R racecar to the summit in a time of 7:57. Since Sebastien Loeb set a record of 8:13 in 2012, only one other driver – Dumas, in a gas-powered, purpose-built racecar – has since driven to the top in less than nine minutes. VW’s electric racer shattered the previous record time to get from the bottom of Pike’s Peak to the top.